The Walton certainly looks the part to start with, a beautiful semi-circular room with their bar extends onto a sizeable terrace overlooking Derby Road. It was not a particularly cold day but the area we wait in had fire crackling away welcoming their patrons. 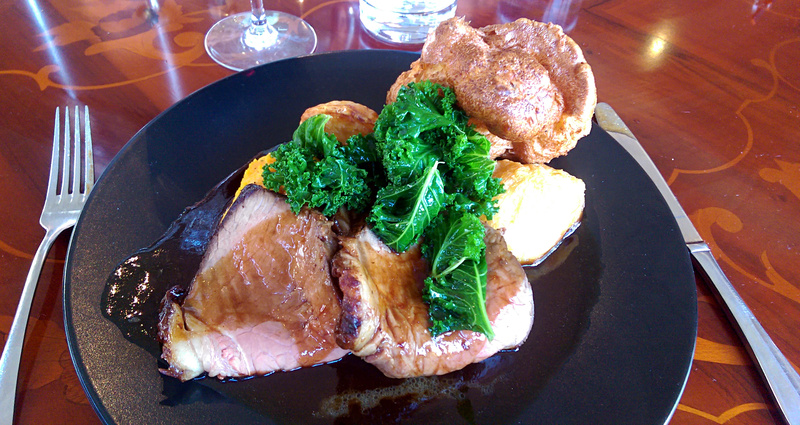 The Sunday lunch menu is quite extensive with 2 courses for £21, 3 for £25 so they’re pricing themselves at the top end. I decided to start with a prawn cocktail to see if they could enhance an old classic. It certainly looked a bit different, and rather pretty though the marie rose sauce with pattern in was a little over the top. What was also striking was two plump king prawns that were well grilled with a smokey flavour. The rest of it remained fairly traditional though the smaller prawns paled in comparison. Derbyshire sirloin of beef graced the plate for the main event, a blush of pink on the meat looking promising. I could have had it rarer and it wasn’t the most tender piece going, but with plenty of fat around it the beef had a very good flavour. Yorkshire puddings were spot on, well risen and not stodgy. Gravy hit the mark too, deep and salty, enhancing the accompanying vegetables. Also on the plate were some almost bitter greens and sweeter bashed roots which worked well together. A large additional bowl of veg was presented as well, although we probably didn’t need it all as well! It wasn’t quite as good as the rest either, broccoli, cauliflower and red cabbage were cooked adequately but weren’t very inspiring. 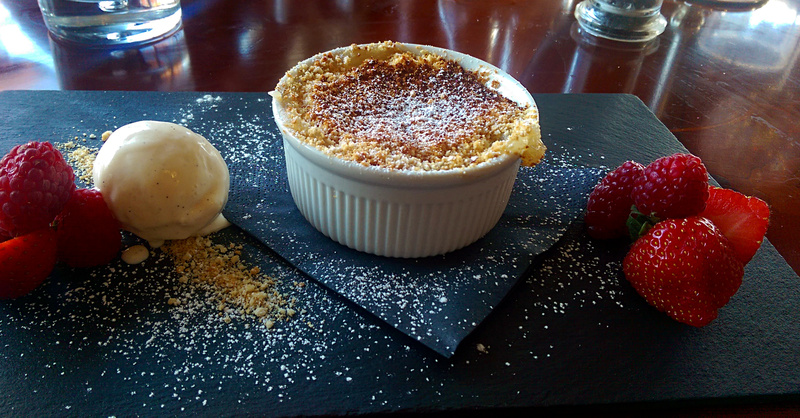 After strong starters and main courses I was looking forward to an apple crumble. The first problem was apparent as soon as the spoon broke the surface, the crumble topping was very fine and not bound to the fruit in any way. The apple themselves were a little soft and overcooked, in combination not a great combination of textures. Whilst the food was rather good in parts, the rest of the experience was somewhat lacklusture. We arrived at 1230 when no-one else was there but there was significant waiting time and staff regularly went AWOL. Some fellow lunchers were quite vocal in their disappointment. I feel the Walton aren’t too far away from something pretty good, the setting is nice and a lot of the food I really enjoyed. With the price comparable to the Hart’s Sunday lunch they just aren’t getting some of the basics right that would come so naturally to a more experienced restaurant.